When I was young, this car made a huge impression on me. In the 50s in my mind’s eye there were hot rods and there were customs. The hot rods were stripped down old 1927 to 1940 cars with bigger motors and better brakes than they originally came with. Kind of sounds like a restomod of today doesn’t it. The customs were late model cars with chopped tops, custom paint and fancy interiors. George Barris came along and built the Ala Karte and to me the world changed, there were new possibilities. The line blurred between custom and hot rod. In high school I spent my study hall time reading books like the one I bought on How to Customize your car by George Barris. I was also reading how to drive fast and corner well in books by Stirling Moss and other well known racers of the day. I was always more into customs and sports cars than hot rods but George Barris showed how these worlds blend together if you are a real car guy. Our newest Feature Car is the Ala Karte. It has been restored to its original magnificence and is a traffic stopper even today. I think it is timeless and just as modern today as it was 50 years ago. Take a look at the Feature on this car and tell me what you think. 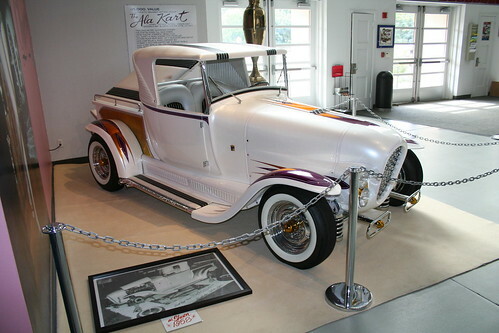 This car is currently (November 2008) on display at the Wally Parks NHRA Museum in Pomona, CA. 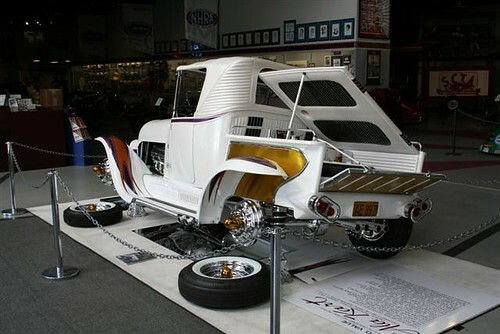 In the not to distant future you will also get to see a car done by George Barris’ brother, Sam Barris. It is a chopped 1949 Mercury that will make you drool.